There’s a funny little throw-away line from Scream 3, spoken by the director of movie-within-a-movie Stab 3, where he complains that he had to direct a horror film before he could do the classic love story that he wanted to direct. Even though Music of the Heart comes before Scream 3 in Cravenous chronology (and it’s not really a “classic love story”), I mention the line because the exact opposite is how Wes Craven ended up getting this film to direct. He basically went to Dimension and the Weinsteins and said that he would direct the third Scream film only if they gave him the opportunity to direct something non-horror. When you have a director of Craven’s horror-cred caliber saying he’ll come back to direct another movie for one of the biggest financial boons in your production company’s history? And one that he helped to make so financially feasible in the first place? You kind of do what he asks. And that is how the Master of Horror ended up not only finally getting his wish to direct outside of the genre that he had helped redefine but also getting to direct Meryl Streep to her twelfth Oscar nomination in this decidedly non-horror movie. 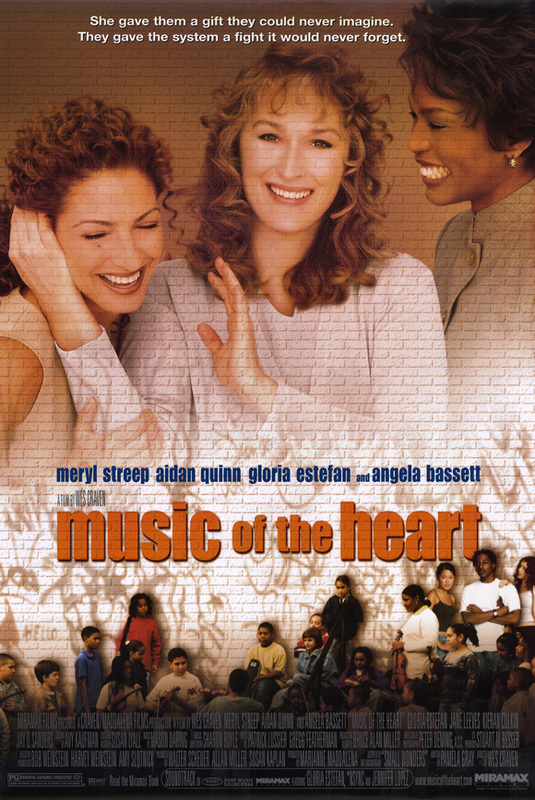 Quick bits of trivia first: The film is based on the true story of violinist and music teacher Roberta Guaspari and her efforts to teach violin lessons to inner-city children in Harlem. The movie came on the heels of, and was basically a remake of a 1995 documentary on Guaspari and her students, Small Wonders. Craven saw the original documentary and found it so poignant that he wanted to make a film of it. Interestingly/sadly enough, at the time that he started making the film, Guaspari’s program had been yet again defunded. This film apparently helped reinstate funding through the attention it brought the program. Pamela Gray wrote the screenplay for the movie, which was originally titled 50 Violins. Gray hasn’t written a lot, but I would like to point out for my own geeky delight that she wrote the episode “Violations” for Star Trek: The Next Generation. It’s a rather dark episode, but it also prominently features Dr. Crusher, so thank you for that. Believe it or not, Meryl Streep was not the original choice to portray Roberta Guaspari. Madonna was originally supposed to play her. However, she left the project over “creative differences” with Craven. At the time, she was said to be moving on to topline with Goldie Hawn in the movie version of Chicago. Streep agreed to pick up the role abandoned by Madonna and went on to learn how to play the violin for the movie. She actually learned to play Bach’s Concerto for 2 Violins for the film. And this is part and parcel of why Meryl Streep has been nominated for an Oscar 19 times. The rest of the cast is familiar but relatively B-List in comparison with Streep, which is by no means a dig against any of the rest of the cast. Practically all of Modern Hollywood is going to come up B-List against Streep. The only one close to Streep’s level in this film is Angela Bassett, returning for her third role in a Craven production. Other familiar faces are Cloris Leachman, Aidan Quinn, Gloria Estefan (in her first acting role), Jane Leeves, Jay O. Sanders, Kieran Culkin, and violinists Isaac Stern, Itzhak Perlman, and Arnold Steinhardt playing themselves (along with a cavalcade of several other famous violinists and fiddle players for the big concert scene at the end). As for the children in the film, many of them were actual students from Guaspari’s classes. When I realized this, I was a lot more lenient on some of their stilted performances. Child actors are fine, but it’s something special to have kids from the actual story, who know how to play the violin and give pretty decent acting performances, all things considered. The movie was directed by Wes Craven, known for his horror films (“Scream,” “A Nightmare on Elm Street”), and he may seem like a strange choice for this material. Not at all. He is in fact a cultured man who broke into movies doing horror and got stuck in the genre; he’s been trying to fight his way free from studio typecasting for 20 years, and this movie shows that he can get Meryl Streep to Carnegie Hall just as easily as a phantom to the opera. Craven does, indeed, prove his worth as a director beyond the realms of the phantasmagorical and horrific. His style is direct, keenly focused on telling the story without ostentation, but instead with honesty and simplicity. The tale itself is wrought with enough emotion and pathos, and Craven had the wisdom to let that shine through on its own, without any additional embellishment. He also clearly had the wisdom to let his star shine on her own, knowing that Streep would bring truth to her role in her own inimitable way. In interviews about the film, Streep confessed that she had never seen any of Craven’s other films, and Craven stated that he had to have a “rather lengthy erudite conversation” with Streep to convince her to consider the role (and also that Streep called him out for the fact that her daughters had watched Scream and were afraid to sleep in their house for several nights…personally, I think that should have worked in Craven’s favor, speaking to his acumen as a master of his trade). The bottom line is that this movie was a glitch in several regards. Die-hard Craven fans typically ignore it because it’s not horror. Non-horror fans typically overlook it because Craven’s name was so synonymous with horror that they must form immediate negative opinions about the film that ultimately are quite untrue. Yes, the movie tipples into saccharine territory now and again. Yes, it proves stereotypical at times, but it also moves beyond the stereotyping to showcase the diversity of life in the Harlem neighborhoods in which this tale occurs. Craven started his own career in the heart of New York City after he divorced his first wife and pursued his dream of becoming a director. He knew that beneath the gritty facade of the city, there was a depth of diverse beauty to be found if one looked closely enough. With Music of the Heart, Craven took us in for that deeper look and what he showed us was an unanticipated masterpiece.